A few years ago, for about a six month period, I did freelance SketchUp work for Sawtooth Ideas. 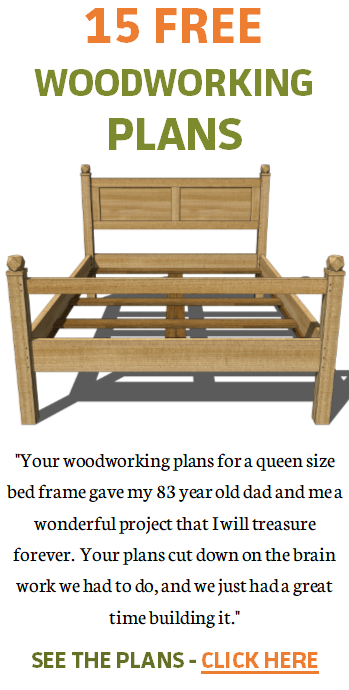 This company offers software which enables a woodworker to download a project plan from their site, and using their proprietary software, see a 3D model of the project. This 3D model can be easily exploded, components zoomed in for closer inspection, etc. This required a SketchUp model for each project in their library of plans. I was one of a handful of people who made the needed SketchUp models. 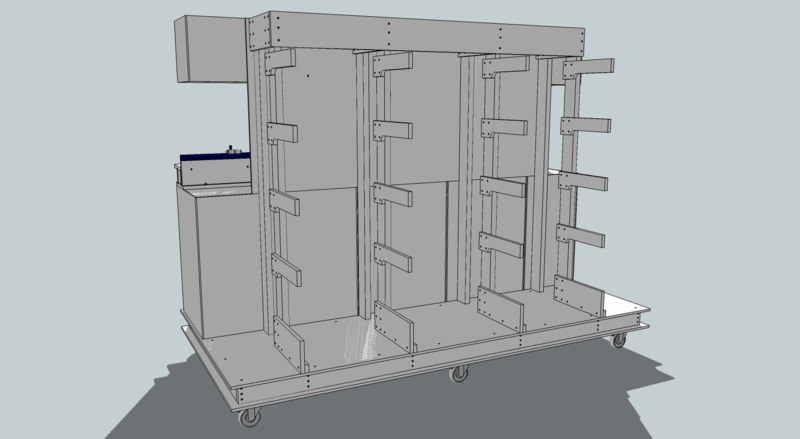 To date, this is the most complex SketchUp model I have created. It has over 400 screws in it. These screws also have over 400 counter-bored screw holes. I also had to create screw holes for the mating part. Think on that a minute. The screws had to be positioned correctly (no small feat) and then I had to create the required holes for the screws (two holes per screw). This was such a mind-blowing project, it wasn’t long afterwards that I quit. Making this model required a lot of detective work because I had to make it more accurate than the plan. The woodworking plan which served as my guide was vague in several ways. I had to study the plan in great detail to determine how to make a successful SketchUp model for Sawtooth Ideas’ proprietary 3D viewing software (see a YouTube video about this project – I made the 3D model seen in the video). 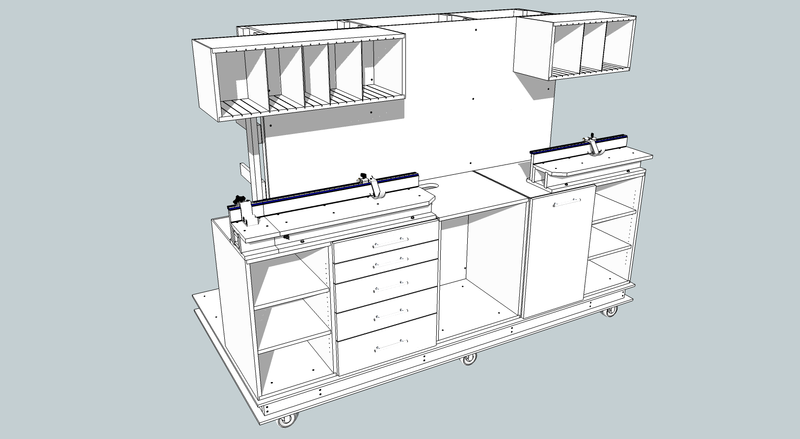 I mentioned the Deluxe Cross-Cut Station SketchUp model because my new SketchUp project shares some similarities with it. So what is the new project? Each year, the Alabama Woodworkers Guild builds a full set of kitchen and bath cabinets for a Habitat for Humanities home in the Birmingham, Alabama area. My task is to create new working plans for Guild members to work from as they build the needed cabinets. The big project: make 3D models of this along with extensive documentation. The existing documentation has been altered over the past few years and the project manager for Alabama Woodworkers Guild wants a clean set of plans. And now the similarities with the cross-cut station SketchUp model: I am having to study the old Guild documentation and fill in some blanks. So far not all of the dimensions are given which makes getting underway a challenge. And, while the model I make will be free of screws (thank the good Lord above), this will be the most challenging documentation project to date. When I saw the Guild construction documents from prior years, I immediately thought of SketchUp Pro and specifically LayOut – a program which is packaged with SketchUp Pro. LayOut is capable of creating architect quality documents. A few years ago, I made contact with a marketing guy at SketchUp. 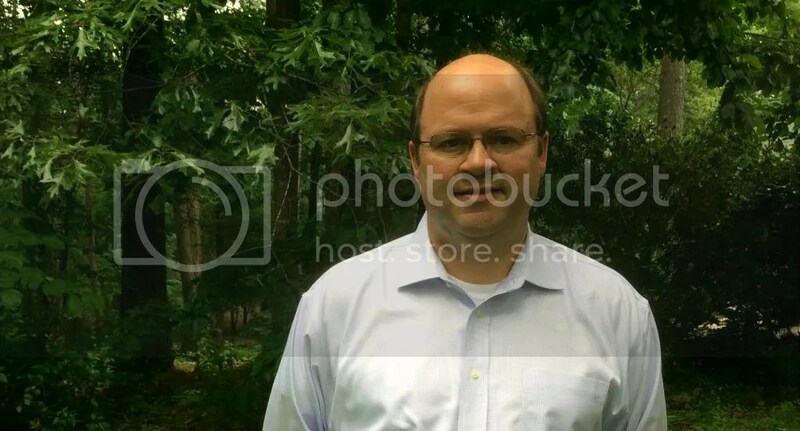 I reached out to him about this project and he has found a way for me to get SketchUp Pro free of charge, at least for this project, maybe even longer. Pretty cool. Here is what I have currently. 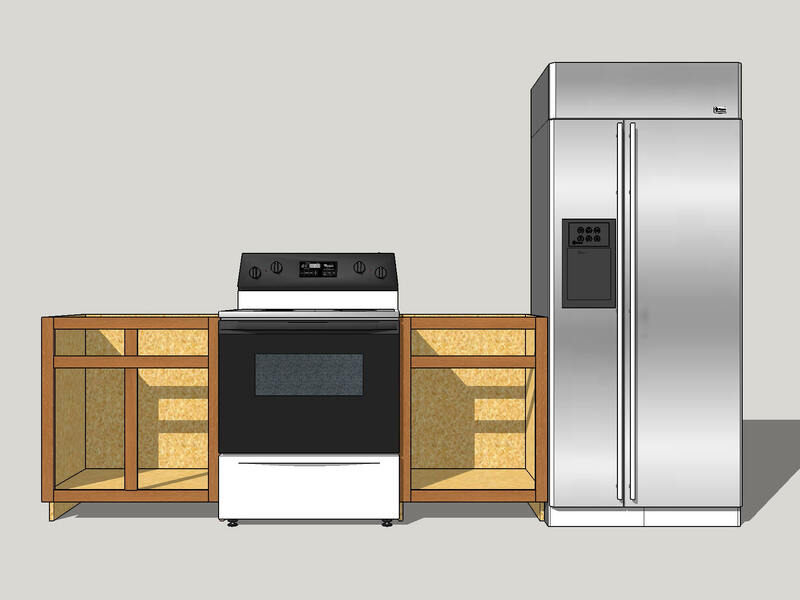 With appliances borrowed from the 3D Warehouse. I have just the kitchen base cabinet boxes completed now. I’ll add the doors next. My hope is that I can make just one set of everything, make copies of that, and then adjust the size to fit the various requirements. The modeling will, hopefully, be pretty basic stuff. I am mulling over in my head how best to get organized on the documentation. 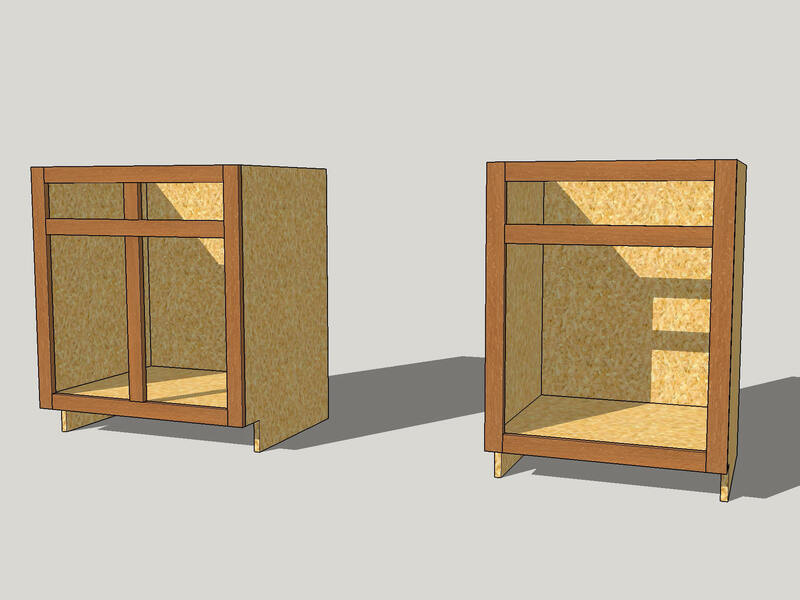 What I come up with will probably just be a variation on my typical woodworking plan format – project overview images followed by documentation for building each cabinet. 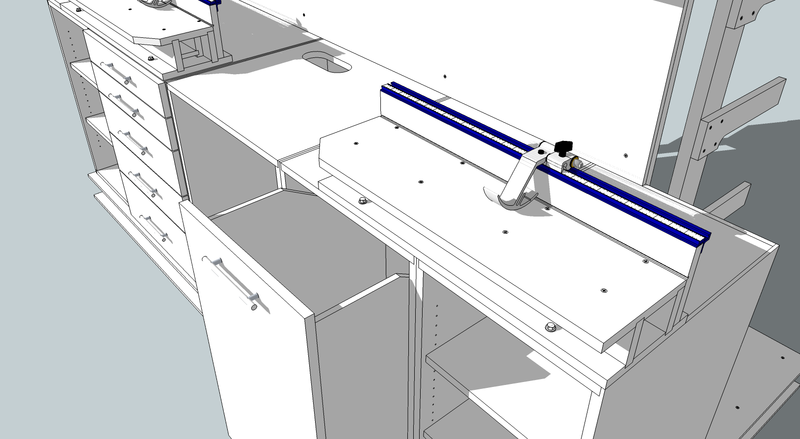 But, I’ll have to make extensive use of the SketchUp Cutlist plug-in to include cutting diagrams for sheet goods. All-in-all, a big SketchUp project. Thanks Jeff for the very well written explanation of using SketchUp for an actual project. I really feel like I get a bit closer to seriously using this program every time I read one of your writeups. Lots of experience with AutoCad and Microstation in a completely different area but just not ready to stuff my head full of yet another program with all its nuances. Keep the info coming….when you find time. Hey Dennis, thanks. I’ll try to focus on some good SketchUp tips during this project. Hey there Jeff. I have been following your post for some time now, but have never commented. I discovered SketchUp some years ago and have been hook on it since. I have always loved drafting and autocad and sketchup being free has been, awesome. Anyway, I just figured that I might be able to help you with any questions that you may have with this current project. 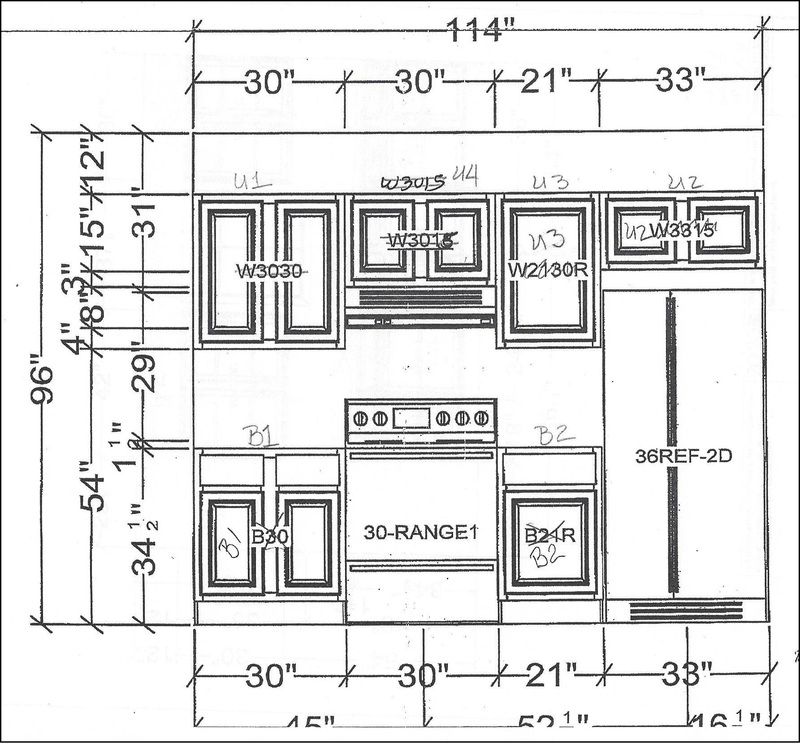 I worked for Lowe’s for 11 years as the Installation Manager where I had some experience helping our kitchen installers, and prior to that I did some kitchen design work for Lowe’s customers. Anyway, I just thought if you had any questions I may be able to help answer them. Hey Tim, thanks for the offer. I sure will let you know. That is awesome! I hope they let you keep it Jeff. I had started the trial version way to early in my SketchUp endeavors to make any real sense out of it. If I could try it again I think it would be cool but I do not make any money at this stuff so hard to put 5 bills into a program after what I spend on tools LOL.Can’t wait to see it! The trial version is good, but unless you already know how to use LayOut or the other features of SU Pro, it is hard to determine if the cost is warranted. My hat is off to you. I hope you get to keep the software, too. Looks good Jeff. You might consider dynamic components – but I don’t know how CutList will handle them. Lookin’ forward to the posts.